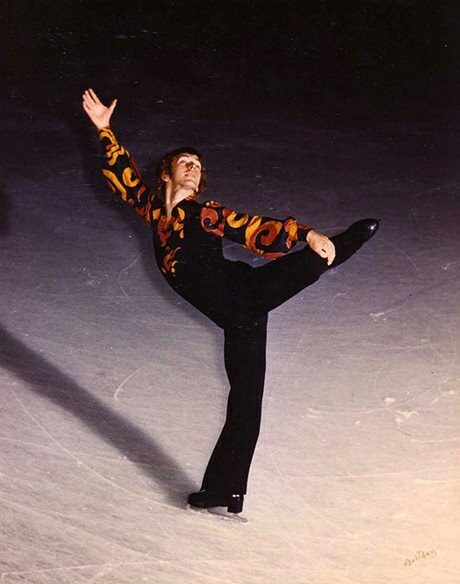 Toller Cranston (1949-2015), a Canadian National figure skating champion, pushed boundaries in skating through his unique artistry. He took up skating from a young age. When he was just 10 years old, Cranston’s family moved to Montreal, where he began training with Eva Vasak, a renowned figure skater. Through her coaching and with later assistance from Ellen Burka, Cranston developed a unique artistic style that would revolutionize men’s figure skating. As his skating was more of a creative performance, he was often criticized by judges for not meeting compulsory technical requirements. But he was adored by the public. He won a bronze medal at the Winter Olympics in Innsbruck, Austria in 1976. Cranston’s artistic expression found another outlet off the ice. Shaped by his education at L’Ecole des Beaux Arts in Montreal from 1965-67, Cranston developed an interest in, and proficiency at, painting. He was able to support his skating through selling his artwork, which was immensely popular. Cranston retired from skating in 1997, and continued to paint until his death in 2015. Watch Cranston skate at a fundraiser to restore Victoria Hall in Cobourg, Ontario (a building protected by an Ontario Heritage Trust conservation easement). Read more about Cranston on the Canada’s Sports Hall of Fame website. See some of Cranston’s paintings on the Koyman Gallery website.